Twelfth of July Bonfire. Belfast, Northern Ireland, 2005. People who work in the arts industry need to find an audience for the work they present. Failure can be heart-breaking; you can lose thousands of dollars of your own or other people’s money and even lose your job because of a poor audience turn-out. Most arts administrators, me included, have learned how to attract an audience the hard way, and for these and other reasons, arts organisations often have strategies in place to build new audiences. Many orchestras have looked at their typically white and elderly audiences and tried to work out how they can attract a more diverse audience that reflects the diversity of the public outside of concert hall doors. For many orchestras, doing so is a matter of life or death because if they can’t find a younger audience, they simply won’t have an audience in the coming years and will be forced to close their doors. When you work to create audience building strategies, you necessarily reflect on why people don’t come to your events, and work to make your events more inclusive in response. When I was working in the orchestra scene, it was often said that the best way to bring new audiences to orchestra concerts was to make the concerts more accessible. I once implemented a modest cultural outreach program for an orchestra. Essentially, I contacted community groups such as refugee support agencies and provided them with free or subsidised tickets for orchestra concerts. I remember one concert in particular where a large group of mostly African refugees attended a concert and for most it was their first experience of live orchestral music. Needless to say they loved it and said they’d return for more. Orchestras are expensive beasts and in these days of austerity budgets governments around the world are cutting the subsidies that they provide to them. I could talk ‘til the cows come home about the value of orchestras to society (see my writings about orchestras for more), but many people simply don’t see this value. Newspapers love it when an orchestra is facing bankruptcy because for every person who supports government funding for orchestras the newspaper gives voice to another who deplores the very concept. Those against government subsidies speak of “priorities” such as reducing emergency room waiting times and improving peak-hour traffic flows and argue that taxpayers shouldn’t be forced to pay for the entertainment or ‘lifestyle choices’ of a narrow subsection of society. These sorts of debates involve readers in online forums, sell papers or gain website hits, but I hypothesise that many people who argue against government subsidies for orchestras have never even attended an orchestral concert. Similarly, people who fail to see the value of music education for kids probably never had music lessons themselves, or perhaps had a bad experience of it like a nasty piano teacher who would crack a ruler over their uncoordinated fingers. Here’s something I learned about sport: Most people I know who say they “hate” sport in general, are people who simply didn’t grow up with it, were never really exposed to it or had a bad experience of it. For example, people might hate sport if they weren’t any good at it at school and were teased about having two left feet. People who think it’s a waste of time for students to learn foreign languages at school are invariably mono-lingual themselves. Likewise, of all the voices who say that advanced degrees are a waste of time, most are people who don’t have them. My point is that there is a tendency for people to be against, or hate things they have no experience of or have had a bad experience of. People hate things that make them feel excluded, and for some people, feelings of exclusion extend to feeling threatened. When I read fearful or hateful comments in online forums directed at people of minority groups I often wonder if their hatred stems from the exclusion they feel when encountered by something they are unfamiliar with. I doubt that many people who support the anti-Muslim “Reclaim Australia” movement, if it qualifies as one, have even met a person of the Muslim faith. Those that have will surely point to their real or perceived bad experiences, however often the “bad” experience described is akin to the experience of a nasty piano teacher or cruel school bully who teases kids that are bad at sport; a one-off experience from which it’s unfair to judge the rest. I’ve spent time living in both outer-suburbia and inner-city locations in Australian cities. I’ve witnessed less day-to-day racism from my inner-city neighbours than my outer-suburbia neighbours, and I also had a more culturally diverse range of neighbours when I lived in the inner-city than I did living in the predictably white bread suburbs. The link that I’m hypothesising between the two is that people who aren’t used to having a level of cultural diversity in their neighbourhood tend to be more racist than people who have neighbours from various parts of the world. To put it more bluntly, many people who hate migrants often don’t know any migrants. I think this argument can be extended to suggest that people who hate gay people often don’t know any gay people. It’s illogical, irrational and uneducated but typical of how racism and hatred works. I spent three years living in Northern Ireland, a divided community where there was a lot of hatred against “the other”. I’ve already written about how my time in Northern Ireland taught me to hate flags (see Australia Day and why racism is bad for business), but I also developed a loathing for labels like “us”, “them”, “theirs” and “ours”. Not long after arriving in Belfast, I moved into a share house of mostly Catholics and as a result, most of the friendships I formed were with Catholics. I just as easily could have moved into a share house of Protestants and became friends with mostly Protestants. Being friends with so many Catholics meant that I got to enjoy many of the Catholic festivities such as St. Patrick’s Day, but as an arts worker I wanted to experience some of the Protestant cultural events too. My opportunity came when an Australian friend suggested that we go to a Twelfth of July bonfire, a Protestant celebration. Our Catholic friends thought we were mad, and they told us that when the Protestants heard our funny accents they’d shoot us dead. 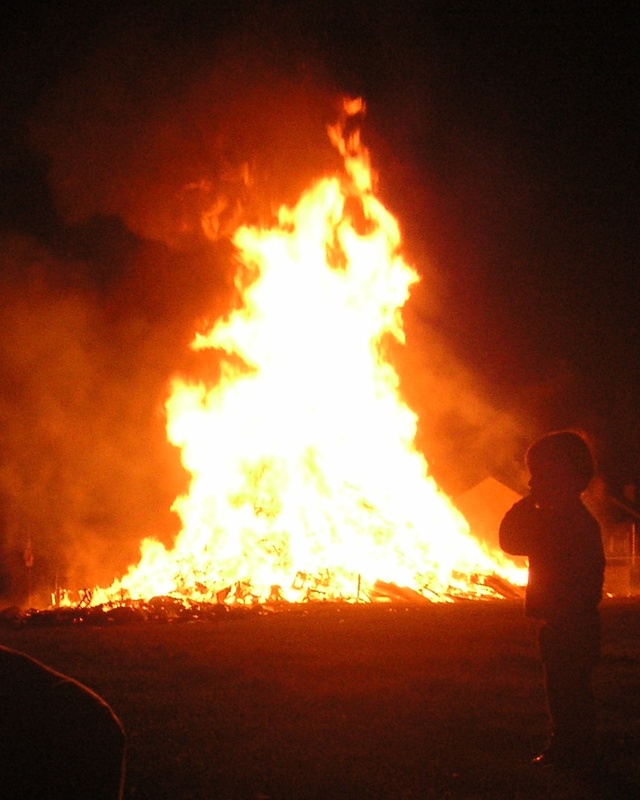 So we approached the local bonfire with trepidation, and the warnings of our impending death still ringing in our ears. We could see the celebration from across the river where Catholic kids were shouting abuse across the water, and from a distance we thought the celebration looked peaceful enough; we figured they wouldn’t shoot us dead while their little kids were running around. We approached the bonfire, sat some distance away and drank some beer. As the night progressed more groups started sitting near us, also drinking beer, and as it goes when people drink beer, we got to talking. In the end it was a good fun night spent with some friendly people, and all-in-all my friend and I agreed, it wasn’t terribly unlike spending St. Patrick’s Day with our Catholic friends. The Protestant people we met that night weren’t noticeably different to our Catholic friends and in any other country, if they all met, they could all be mates. Counteracting feelings of exclusion, fear, or hatred of the “other” can sometimes be as simple as ensuring that people get to know each other. With older people it’s more difficult, but with younger people it’s more straightforward because the hatreds haven’t become entrenched. The primary responsibility of government is to maintain national security, and this means not only protecting the nation from military invasion but also preventing civic unrest. Maintaining social cohesion is therefore a part of this responsibility, and knowing that social cohesion is built by people of different groups developing mutual understanding and respect, governments these days rightly fund programs designed to ensure that young people get to meet people from other groups. This is done through subsidising programs and activities like student exchanges and multicultural arts initiatives. Developing this type of cross-cultural understanding is important in my home country of Australia for many reasons, including assisting the reconciliation process between Indigenous and non-Indigenous Australia and helping us to become a more outward looking nation that can operate more comfortably in our own corner of the world. Unfortunately, haters are a part of our society and aside from being your neighbours and work mates, they hold positions of power and influence in governments, business and the media. The current Australian government is full of people who see things very much in terms of “us” and “them”, similar to many in Northern Ireland. This isn’t surprising as their leader, the Australian Prime Minister Tony Abbott is a Catholic and a graduate of Oxford University; two influential institutions that have built their whole raison d’etre, influence and wealth by entrapping portions of society into seeing the world in black and white terms such as “us” and “them”. Sometimes I think racists and haters just need to get out a bit more. Living abroad and travelling, and I mean the real stuff where you fully immerse yourself in another culture, can make you get out and meet people you otherwise would be unlikely to meet. The more time you spend with “them” the more you will realise they are just like you, in which case you can begin to empathise and see things from their point of view. Tomorrows leaders will have a better grasp on the finite nature of the world and the interconnectedness of all people, living things and the planet. We need these types of leaders because with humanity existing in such vast numbers where we are practically all living on top of each other, and with dwindling natural resources heightening the risk of conflict, it is not palatable or practical to have leaders who still rely on old fashioned and intellectually lacking concepts of “us” and “them” to govern. The leaders of tomorrow won’t be haters, will have gotten out more, seen more of the world and have an ability to empathise with the “other”. Actually, cancel that, they probably won’t even see the “other” as the “other” because they have the knowledge that the only way we will ever pull through on this small planet is by working together and thinking of humanity as one. If you like this post please share it on the social media and be sure to check out the blogroll for previous posts. Next Post The kids are alright. Reflections on music education and culture.